New six-cylinder in-line engine with M TwinPower Turbo technology, based on the power unit from the BMW M3/M4, three-litre cubic capacity, 302 kW, peak torque of 550 Nm (combined fuel consumption with six-speed manual gearbox: 10,0 – 9,9 l/100 km; combined CO2 emissions: 228 – 225 g/km*; combined with optional M Double Clutch Transmission (M DCT): 9,2 l/100 km; combined CO2 emissions: 210 – 209 g/km)*. 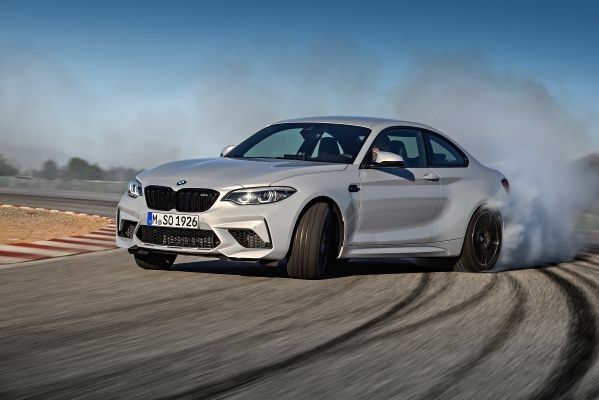 The BMW M2 Competition will be available in South Africa from September 2018. Pricing will be communicated in due course. The values of the vehicles labeled with (…) are already based on the new WLTP regulation and are translated back into NEDC-equivalent values in order to ensure the comparison between the vehicles. [With respect to these vehicles, for vehicle related taxes or other duties based (at least inter alia) on CO2-emissions the CO2 values may differ to the values stated here]. The CO2 efficiency specifications are determined according to Directive 1999/94/EC and Pkw-EnVKV in its current version applicable. The values shown are based on the fuel consumption, CO2 values and energy consumptions according to the NEDC cycle for the classification. For further information about the official fuel consumption and the specific CO2 emission of new passenger cars can be taken out of the „handbook of fuel consumption, the CO2 emission and power consumption of new passenger cars“, which is available at all selling points and at https://www.dat.de/angebote/verlagsprodukte/leitfaden-kraftstoffverbrauch.html .